Holiday Schedule and new designs from the Portland Textile Club! 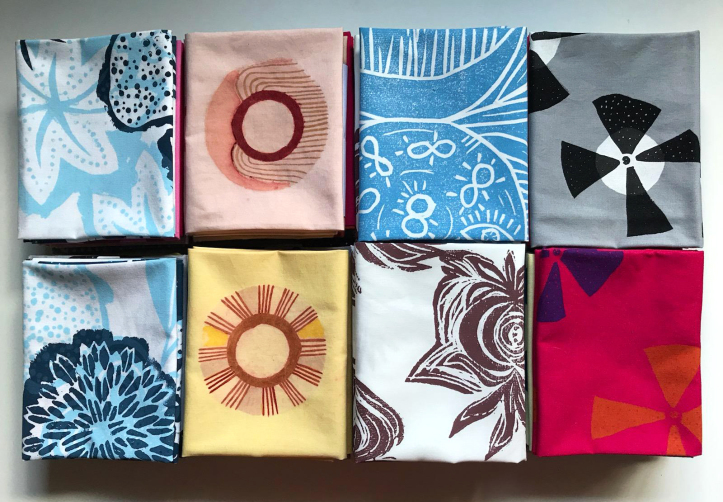 A sampling of the hand printed fat quarters designed by the members of the Portland Textile Club. Fat quarter bundles are available now in store! Hi there! We will be taking our usual break on Thursday AND Friday, November 22nd and 23rd for the Thanksgiving holiday. We’ll be rested up and ready for you all on Saturday! We just received in a new collection of fat quarter bundles by the Portland Textile Club. These are all hand printed, some hand-dyed, fabrics, using a variety of techniques by four different Portland artists. The line up includes April Alden (some of you may know her from her days at Bolt! ), Alice Rotsztain, Lisa Key and Palmarin Merges. You can find the PTC site here , more of Palmarin’s work can be found here and on IG, you can follow April @prillamade , Lisa @pieholeprints , Palmarin @palmarinprints and PTC @portlandtextileclub . These one of a kind prints make a special gift for the sewist in your life! New Store Location Opens Monday at 10! Fabric Depot's closing: How can we help?